Honda Accord Front Seat Support & Comfort Pros and Cons | Page 1 of 2 | Why Not This Car? Front headrests are inclined too far forward, making the seats very uncomfortable for shorter drivers. Drivers taller than 6'3" won't have a problem. But as a shorter driver, the uncomfortable seats have caused extreme upper back pain. Many reviews online state how comforable the seats are in the Accord, I cannot agree with them. I have owned a 2013 Altima as well and it is much more comfortable, but that car has a stability problem on the highway. 6'4" and plenty of head and leg room. Leather seats and lumbar support fit me well. Another reason I'm glad I got the EX model. The power lumbar on the drivers seat is my backs best friend. Even after 16 hour days and 1100 miles, my back is fine. Excellent seats! power adjustable, soft comfortable leather. one bad thing: getting access to rear seat behind driver is very slow-- power seat moves forward slowly. Spacing is good, material use is comfortable. its comfortable for driving for a long period of time. Heated leather seats are supportive. This sedan has the most comfort of any sedan I have been in. 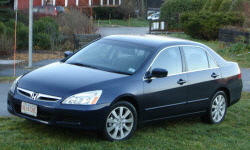 Others may have had a little more room like the camry but the accord was more comfortable. I am also 6 foot 4 and plenty of head room. The front seats have good side bolstering for spirited driving. They are also comfortable for long trips.